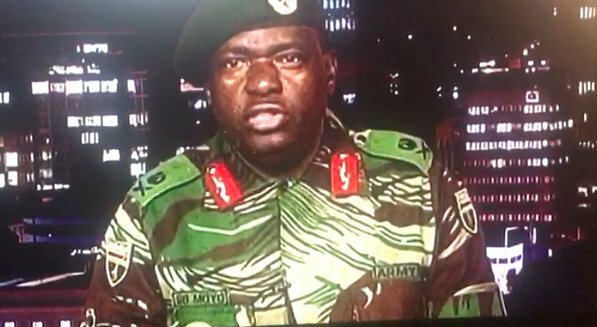 HARARE, Zimbabwe – An anti-Mugabe sector of the army, led by General Constantine Chiwenga, has taken control of the main TV station in Harare, following threats that the military would take governmental matters in its own hands following Mugabe’s dismissal of Vice-President Mnangagwa. Mnangagwa has tremendous pull with the military and with General Constantine Chiwenga, as he played a major role in the country’s liberation wars. With mounting pressure on Mugabe from the west over the last decade and a half, it is unclear at this moment to what extent this plot also involves the United States. It is a complex situation to assess because while the US has stated its desire to remove Mugabe, inter-party disputes over succession are the apparent cause. Mugabe has not directly said that Mnangagwa is backed by foreign forces, only that he is ‘ideologically’ not ‘solid’. Witnesses on the ground have informed international press, such as the AP and Reuters, that explosions and gun fire were heard in the capital, Harare. However, given these agencies’ history of misreporting, it is unknown to what extent those reports are true. Given the appearance on television of anti-Mugabe forces, these may be factual reports. The general understanding being presented in western press, is that a coup is underway. << President Mugabe said he had knowledge of the shenanigans that were being organised. ”As Amai stood to address, I heard sounds, people booing. When he rose to greet the crowd, the same people were jubilant. President Mugabe has told the gathering here that he has known for some time, of the plots by his beleagured former deputy.“We tried to keep it away from the public eye but on Sunday, all was laid bare and we had to act.” “People were ferried from Kwekwe using school buses to come and boo Amai and cheer VaMnangagwa as a way of trying to portray him as popular. – “What led to the expulsion of former VP Mnangagwa is what caused Mai Mujuru to be shown the exit,” says President Mugabe. President Mugabe says his former deputy lacked the supreme discipline and he would infiltrate the structures trying to influence rebellious conducts. – One can not be a leader, President Mugabe says if they do not have discipline. – President Mugabe has castigated tribalism adding that people are just the same. “You can not claim to be the greatest because you come from a particular province. We are one people. Sibanye, Simunye. Tirimunhu mumwe chete, tirivanhu vamwe chete. We are one people,” says President Mugabe. “There were people who were now claiming they are the greatest. They are Karangas. No, we do not want that. We will throw them away. ”Some will mourn and say they lost their leader. Ehe, you have lost your leader because he had become a deviant. We have kicked him out for the same reasons that saw us chasing away Mujuru. He even assisted us to force her out but we didn’t know he was assisting us so that he could do the same.